May 3: Sgt. Stephen Liczbinski, 39, Philadelphia Police Officer. Family and Philly police officers remembered Sgt. Stephen Liczbinski Sunday -- the 7th anniversary of the shooting death of the 12-year police veteran. Liczbinski, 39, was fatally shot on May 3, 2008 when he tried to apprehend three bank robbery suspects and one member of the trio, Howard Cain, fired an AK-47 at the officer, killing him. Cain was later killed by police in the manhunt that followed Liczbinski's death. Seven years later, several Philadelphia Police officers shared Tweets remembering their slain brother in blue. Liczbinski's widow, Michelle, also sent several Tweets remembering her husband on the mournful day. The remaining two suspects, Eric Floyd and Levon Warner, were sentenced to life in prison in 2010 after being convicted of first-degree murder. Cain was the gunman, while Warner drove the getaway car and Floyd handled the weapon prior to the shooting. The bank robbery took place inside a grocery story in the city's Port Richmond neighborhood. 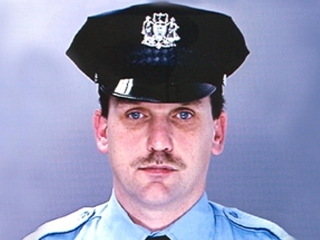 Since Liczbinski's May 2008 death, seven other Philadelphia Police officers have given the ultimate sacrifice. Most recently, the Philadelphia Police Department lost Robert Wilson III, who was posthumously named a sergeant. The department's medal of valor was renamed in Wilson's honor.